When deciding on what are the best above ground pools to buy you can often be spoilt for choice. Selecting the right pool for your needs can quickly become confusing. This article looks at the 10 best types of above ground pools with their own unique benefits. Owning a pool is no longer an expensive ordeal, and we are here to help you select the right one for your needs, some of which you can get for just under $500. 1 Why Choose an Above Ground Pool? 2.1 1. 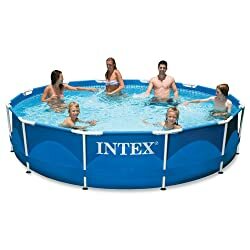 Intex Swimming Pool- Easy Set, 8ft.x30in. Why Choose an Above Ground Pool? If, you are on a budget but still want a pool that is the right size for your family above-ground pools are your best bet. Even though above-ground pools are much less expensive than in-ground pools, the good ones are built to last and made to be practical and functional. There are so many options available for above-ground pools as they come in all kinds of shapes, size, and materials. This allows a buyer to have complete control over the style, layout, and cost of their dream pool. Unlike an in-ground pool, an above-ground pool is fairly easy to set up and install. It can take no more than a few days or even hours to have a fully functional above ground pool whereas in-ground pools can take weeks and even months to complete. Above-ground pools are extremely safe as they have a higher entry point which means fewer slips and accidental falls into the pool. The high entry point and fencing around the pool add to its safety; ensuring that children don’t jump into the pool on their own. Most above ground pools are designed in a manner that makes them relatively easy to maintain. The best above-ground pools require fewer chemicals and less upkeep which helps save both time and money. We now look at some of the best above ground pools available on the market based on features, benefits, price, service, and warranty. 1. 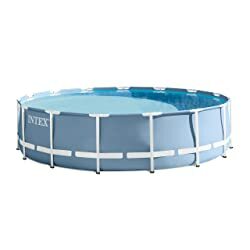 Intex Swimming Pool- Easy Set, 8ft.x30in. 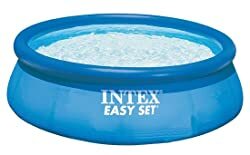 The Intex Easy Set pool is one the easiest pools to install, easy to maintain and store. It is one of the popular pools in the small pool series because of its affordability which makes them ideal for a family of 3-4. This above-ground pool is easy to disassemble and relatively easy to move around – all you have to do is deflate, dry, pack and store. The heavy-duty vinyl sidewalls are highly durable for the pool to last you at least a few sessions. This particular size does not come with a filter pump, ground cloth, and a pool cover. 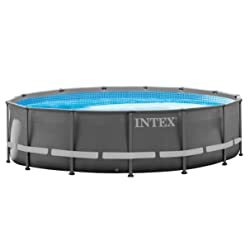 The 14 ft. Intex pool is an ideal size for a small family or a group of 4 people. It comes equipped with the basic items necessary to run a pool, such as a ground cloth, a removable ladder, filtration pump, and a debris cover. The Ultra Frame pool is made of durable steel frames which are rust-resistant. The legs of the frame are much wider at the bottom to make the pool more stable even on the softer ground. It takes more than one person to set up pool in no time. Although not advisable, you can leave the pool set up all year round since it can be winterized. What people like about the Intex Metal frame pool is that it is easy to set up and install. The pool kit comes equipped with many adds-ons that make installation and maintenance a hassle-free experience. This is a perfectly sized pool for small families to relax and enjoy the hot summer heat. It comes with a strong, durable steel frame which is powder-coated to be rust-proof and aesthetically pleasing. It is able to accommodate salt water sanitation systems thanks to its robust design. Easy installation and the fact that it comes with a ground cloth and debris cover makes this an ideal above-ground pool choice for your backyard. 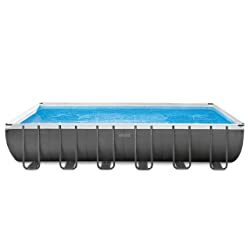 The Steel Pro pool set is manufactured with rust-resistant, excellent quality steel frames which are fitted together with ‘T’ connectors and safety clips to prevent injuries. Although the pool set does not include a ladder, the height of the pool is tall enough to get into the pool with ease. A family of 4 can easily enjoy the pool size in their backyard. However, it is not suitable for swimming. 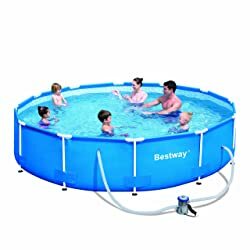 Bestway gives you a very cost-effective alternative to the small sized pools in the market today. If you’re looking for a durable pool set to fill your spacious empty backyard look no further. This 32 by 16 ft. frameset is the largest of its series. The rectangular shape not only looks good but you can also swim laps in them making it more popular. Supported by a rust-resistant solid steel frame, the Intex Ultra Frame pool will last you years. The side-walls are made of super-tough PVC material that prevents tears or leaks. It comes with many additional accessories like a ground cloth, a cover, a ladder, filtration pump as well as a maintenance kit. Intex Ultra Frame pools are your best bet if you’re on a budget and want to enjoy a full-sized swimming pool in your backyard. The best-selling of these pools is this 24 by 12 ft. rectangular pool which is comparatively not as difficult to set up. This size is equally as great for swimming as its larger version. Its powder-coated steel frame provides durability that can last you for years. This pool set also comes with basic items including a ground cloth, a cover, a ladder, and filtration pump. One of Intex’s most popular above-ground pool designs this pool has everything you need to enjoy and relax on those hot summer days. For the price, this product is a steal, especially with all the complimentary goodies. For a large, affordable and easy to install above-ground pool the Intex Prism Frame Pool Set is in a league of its own. Highly recommended for both its price and its quality. 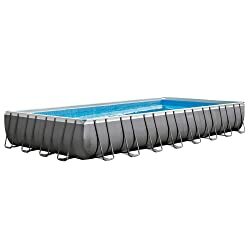 The Summer Waves 10’x30’ Metal frame pool is designed to be both durable and practical. The 10-foot pool is a great size for kids to splash around on a hot summer day. The fact that it comes with a skimmer and filter system means easy maintenance and sparkling clean water all summer long. Ideal for new pool owners as the sturdy construction and easy installment and maintenance makes owning this above-ground pool a breeze. The Splash Pools Oval Deluxe is a large size metal frame above the ground family pool. 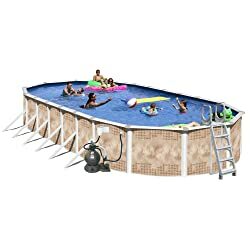 Its heavy duty construction makes it extremely durable and sturdy giving it the look and feel of a high end swimming pool for a fraction of the cost. With all the add-ons that come with it, this is the ideal large size budget pool solution. Just make sure you hire professionals to do the installation! The Coleman steel frame above ground pool is ideal for large sized families or summer parties with friends. The product comes with many add-ons that make maintenance and installation easier. For its size and the equipment, you get this large sized pool is extremely affordable. They are, however, some quality issues relating to the materials used in its construction. Having reviewed the top 10 above-ground pools, it is time to decide on which one would be the ideal choice for your needs. Here are seven things that must be considered in order to ensure that you make the best choice possible. Selecting the right sized pool for your needs can make life a lot easier and a lot more relaxing. A pool to big would be harder to maintain and eat up both time and money. A pool too small would be no fun at all. When looking to install an above-ground pool one must consider the excavation size as well as the pool size. Proper placement will depend on whether you have room for installation. Excavation sizes are more than the pool size to account for space needed for installation. Keeping a mental note of the number of people who would most often use the pool can also be a great benchmark for deciding the size of the pool you would want to go with. Even though size matters more than shape, it is still an important factor to consider. Most above-ground pool come in three shapes; oval, circle and rectangle. Rectangle pools are better for swimming laps whereas circle and oval pools are just a blast to be in! The type of material you choose for your above-ground pool has more significance than one can imagine. The right quality material would mean fewer repairs and less upkeep and maintenance which would lead to much greater cost savings in the long-run. Above ground, pools can be made from a wide range of materials such as PVC, soft vinyl, aluminum, stainless steel, and resin (a type of plastic). The best above-ground pools have a high entry point that makes it harder for people especially kids to get into the pool whether by choice or by accident. Removing the ladder after use can often be enough to ensure that no child would be able to go into the pool without your knowledge or permission. Always keep an eye out for bundle deals as these can often be more cost-effective. Paying a little extra to get a whole bund of goodies is never a bad idea especially when it comes to above-ground pools. Equipment such as a pool ladder, ground cloths, filter pumps, and debris covers are vital components of any above-ground pool and if bought separately can often cost a lot more. Do-It-Yourself (DIY) pools are often a lot cheaper to purchase but if you lack the necessary knowledge and experience these above-ground pools can become a nightmare to set-up and often end up in the garage along with other failed projects. If you don’t know much about pools, we would highly recommend you to hire a professional to install the pool. Do-It-For-Me (DIFM) can often be the wisest choice when it comes to having a properly constructed above-ground pool. Price always plays a big part in any buying decision. With so many brands and options available selecting an above-ground pool that has all the right elements you want can greatly help in the price comparison. Matching those benefits with other available options can lead to the best purchase decisions. It is always a good idea to with a well-renowned brand when it comes to purchasing above-ground pools. This is because a reputable brand would have a much better warranty and after-sale support than a non-reputable or new brand. Selecting popular brands that are credible would mean cheaper and readily available spare parts leading to easier and more cost-effective maintenance and upkeep. Carrying out simple maintenance tasks can greatly increase the lifespan of an above-ground pool. Even though an above-ground pool requires less care and attention than in-ground pool maintenance and upkeep can still be extremely challenging. To get the most out of an above-ground pool install a filter pump and ensure adequate water circulation which will help keep pool water contaminant free. Building a cove would help protect the metal frame and pool liner from slipping and general wear and tear. Treating pool water with chemicals can help maintain pH levels creating a safe and healthy pool environment. They are other things as well that would help keep your in-ground pool looking great all summer long. Using a debris cover when the pool is not in use can greatly reduce the number of contaminants and debris that would otherwise find its way into the pool water. Adequate drainage around the pool area is also a must in order to prevent water seepage. The best above-ground pools if properly maintained can easily last more than 15 summers bringing joy and relaxation to the entire family. Below are some useful tips on maintenance that are sure to enhance your pool’s lifespan. Maintenance of above-ground pools is quite a responsibility, but it is worth it especially in the summer when you can simply sit back and relax while watching your kids cool off in the hot summer sun. Here are some tips that will help keep pool water safe and healthy for you and your family. The filter and the pump are the heart of an above-ground pool system and the essential components of keeping pool water clean. By adjusting the eyeball jets on the inlet, you can channel water to move in a circular motion which makes it hard for bacteria and algae to take hold. Cleaning the filter out regularly would ensure sparkling clean pool water. Every pool has areas with little to no water circulation that are breeding grounds for contaminants and algae growth. Thus, walls and floors of above-ground pools have to be brushed and vacuumed once a week to keep pool water clean and fresh. Monitoring and testing pool water using a digital test strip reader is the best way to ensure pool water safety and cleanliness. These devices are able to test two key factors: pH and sanitizers. Maintaining pH and sanitization levels is the assured way of knowing that your pool water is as clean as it gets. Use of choline tablets can help in regulating sanitization levels in above-ground pools. Stabilized and processed chlorine dissolve slower and last longer helping maintain sanitization levels. They can easily be kept in a skimmer, floater or feeder for continuous sanitization. Contaminants and debris will build up in pool water the more it is used often causing eye and skin irritation. When this happens, the best thing to do is to use shock treatment which effectively kills contaminants which tie up chlorine, preventing it from keeping pool water clean. If your above-ground pool is being heavily used during summer make sure that you shock treat it every once a week to keep pool water looking crystal clear. There are five types of above-ground pools one can choose from, and they range immensely in terms of price, durability, and functionality. A semi-in-ground pool as the name suggests is an above-ground pool that is buried halfway into the ground. These pools are made from ¼ inch thick tongue and groove aluminum slats that slide together making the pool wall extremely strong and durable. A semi-in-ground pool is an ideal choice for a swimming pool if your yard has a slope or if you have plans to build a deck but want to use as few materials as possible during construction. Another amazing feature of a semi-in-ground pool is that it is capable of having a salt water sanitation system. The thick aluminum will not rust out because of the salt. 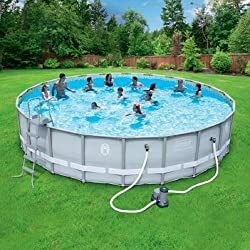 This type of above-ground pool is the most expensive in terms of price but still only a fraction of the cost of an in-ground pool. This type of pool is a combination of resin and steel. A hybrid above ground pool has most of the characteristics of a resin pool and the strength of a steel pool. The best hybrid above-ground pools offer true radius top ledges and contoured resin components that allow for a more modern appearance. A true hybrid pool has steel uprights attaching to coping made of steel while the rest of the components are made from resin. These steel coping rails are designed so that they can be switched on some pool models in order to support saltwater applications. The resin type pool was invented in the 80s by a company called aqua liter. Today, these resin pools have been greatly improved in terms of resin materials, salt applications, versatility, and costs. High-quality resin above-ground pools are made from Synflex resin while the rest are made from lower quality grade resin. Lower quality resin pools crack during cold weather and soften when it’s hot. Synflex resin or talc filled resin material, on the other hand, is extremely durable and able to withstand extreme temperature changes. Resin pools are perfect for saltwater sanitation applications and are much more affordable than other above-ground pool types. This above-ground pool is made from one continuous sheet of aluminum including all the components and walls. This makes it ideal for saltwater sanitation systems as it does not rust. Rolled aluminum is also extremely durable. Less expensive than semi-in-ground pools these are a great alternative for saltwater sanitation systems without having to spend too much money. Above-ground pools that are made of steel are the preferred choice for most pool installers. Most steel pools have top caps made of resin allowing some accents to shine through. Steel quality matters and the best above-ground steel pools are built to stand the test of time. Above-ground pools made of steel are ideal when you are looking for a large size pool on a tight budget. When selecting an above-ground steel pool factors such as ribbed uprights and thicker steel components have to be taken into account as they are many different grades of steel quality. Steel pools are a great choice if you are looking for strength above all else. With newer protective coatings like plastic, Dura-Tex, Texture-Kote, Poly-Enamel, Zicguard-275, and Tru-Kote bonding the best above-ground steel pools can last well over 20 years. For its durability and strength steel, above-ground pools are the most cost-effective pools in the world and are relatively easy to install. The four most popular above-ground pool brands have all distinctive features and benefits that set them apart in this highly competitive industry. Coleman Pools is a well-reputed US company that is well-renowned for its premium quality above ground pools. Coleman is a trusted name, and its above-ground pools are known to be sturdy, stylish and affordable. Intex is another leading US company well known for its high-quality recreational gear as well as above ground pools. Intex has a diverse portfolio of above-ground pools that range greatly in terms of design, price, size, and shapes. Bestway above-ground pools have been recent introductions to Costco and are cheaper than the more established brands like Coleman and Intex. They are made from high-quality materials and are beautifully and practically designed making them ideal for children and adults alike. 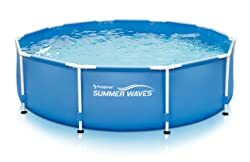 Summer Waves is also a new brand addition and gaining immense popularity in the above-ground pool enthusiast community. The brand is also relatively cheaper than its counterparts and so far has received many positive reviews. All these four brands are credible and well-renowned for providing quality products at affordable prices. Deciding which of these four brands is the best is like picking apples from oranges. Each one comes with its own unique benefits. At the end of the day, it comes down to which one is offering the best deal! Q: When would be the best time to purchase an above-ground pool? A: Even though it is tempting to purchase an above-ground pool thanks to its fast installation right before summer time this may not be the ideal choice. In fact, purchasing an above-ground pool right after summer in the months of September onwards can result in huge price savings. Q: What is the pool water circulation and why is it important for above-ground pools? A: Pool water circulation is a process that allows water in the pool to move about in a circular fashion to avoid contaminants and algae from settling down. This helps with pool hygiene and water clarity. Q: Why is placing an above-ground pool on level ground important? A: Any above-ground pool should always be placed on the level ground as otherwise, the whole structure is likely going to collapse. If the ground is not level first, you must level it out in a way that it is able to support thousands of gallons of water. Q: How deep are above-ground pools? A: The depth of above-ground pools can vary greatly depending on its dimensions, materials, and manufacturer. Above-ground pools normally have an average depth of 42 inches but can go well over 60 inches depending on specifications. Q: Are above-ground pools safe for children? A: Arguably above-ground pools are safer for children than in-ground pools as the higher entry point means that pets and children alike cannot accidentally fall into the pool on their own. Q: Do above-ground pools require any maintenance? A: All pools require maintenance and based on the size of your pool the amount of time and money this would require can also vary greatly. Smaller pools are easier to maintain as compared to larger pools that require chemicals, brushing and vacuuming to remain sparkling clean. Above-ground pools are the ideal choice for new pool owners as it is easy to install and much more cost effective. The many choices and options available means that you can get an above-ground pool that fits just about any budget and any specification. The best above ground pools to buy are the ones that bring the most joy and happiness to your lives. No matter what your budget is or what brand you may have purchased the feeling of jumping into that cool refreshing water on a hot summer day is near priceless!